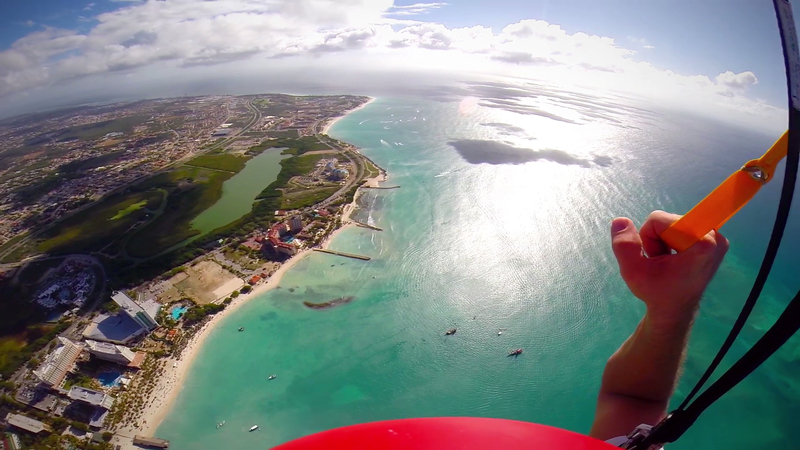 Embrace your daring side with a wide array of exciting extreme holiday experiences, many of which are unique to Aruba! Aruba is world famous for its exquisite beaches, calm waters and relaxed atmosphere, but it also provides a rich variety of adventure-packed land and sea activities to satisfy all levels of thrill seeking. Aruba’s coral reefs, intriguing landforms and constant 15-knot trade winds have made it a hotspot for some of the most exhilarating and unique extreme holiday activities in the Caribbean. Fetch your suncream, let’s go! Prefer staying on dry land? Scale the Ayo and Casibari rock formations or explore the “wild side” of Aruba in Arikok National Park, where you’ll find rolling hills of cacti, dramatic coastlines and ancient caves. Enjoy a challenge on one of the many walking and biking trails, or inject a little extra adrenaline with some high-intensity off-roading by jeep or quad. If you’re into water sports, you’re in for a real treat. Thanks to our constant trade winds, Aruba is ranked as one of the best places in the world to windsurf and kitesurf. Join the locals as they slice through the glassy water and perform aerial tricks at Fisherman’s Huts and Boca Grandi. You can also enjoy unparalleled parasailing, jet skiing, sailing, paddle boarding, kayaking and much more. If the deep blue sea calls, book a deep-sea fishing excursion and catch your own dinner. Fancy a bit of spectacular underwater exploration? Add a scuba diving trip or a snorkelling adventure to your itinerary. Aruba’s entire south coast is a coral reef, with over 20 diving sites and 11 diver-friendly wrecks, such as sunken planes, a cargo ship and battleships. In fact, Aruba has been called the wreck-diving capital of the Caribbean. Still want more? Take to the sky! Get your heart racing on a helicopter tour of the island, or take it up a notch by skydiving and catching one of the most breathtaking views you’ve ever seen. Aruba is one of the few extreme holiday destinations where you can go on a thrilling ride and enjoy a relaxing massage right afterwards! If you’re really just here for adventure, there is plenty of that to go around. Create your very own extreme holiday package with all the exciting activities Aruba has to offer. Adrenaline junkies, take note. Aruba’s reefs and constant 15-knot trade winds have made it world-famous for offering some of the most exciting and interesting extreme holiday experiences in the Caribbean! Featuring world-famous wreck diving sites (there’s a reason we’re known as the wreck diving capital of the Caribbean! ), exceptional parasailing and unparalleled kitesurfing opportunities, there’s always something really fun to do in Aruba. If traditional adventure experiences such as sailing, paddleboarding, deep sea fishing and snorkelling have left you yearning for more, then have no fear, because Aruba offers wealth of extreme activities, from skydiving to off-roading. Keep an eye on Aruba.com for some great extreme holiday ideas that will inspire you to plan your next exhilarating Aruban holiday!